We had a wonderful father's day today. We made a special father's day breakfast and the girl's made homemade cards, and we got the chance to just spend some summertime together. I hope all of you out there had a great day spent with the one's you love too. One of my favorite things about dad's is how different their roles are today, than they were even 20 years ago. My dad was such a nice guy and truly a great dad, but my parents had a very old style arrangement where he worked, and my mom stayed home to raise the children/cook/clean. I love seeing how much more my husband and other dads do nowadays without even thinking twice about it. (Honestly I can say he has changed more diapers than I have). We were blessed that both of us could take three months off of work to care for Calvin, and I am grateful that it's becoming more common for dad's to take time off for the birth of their children. I feel so grateful every day for the amazing dad's in my life. 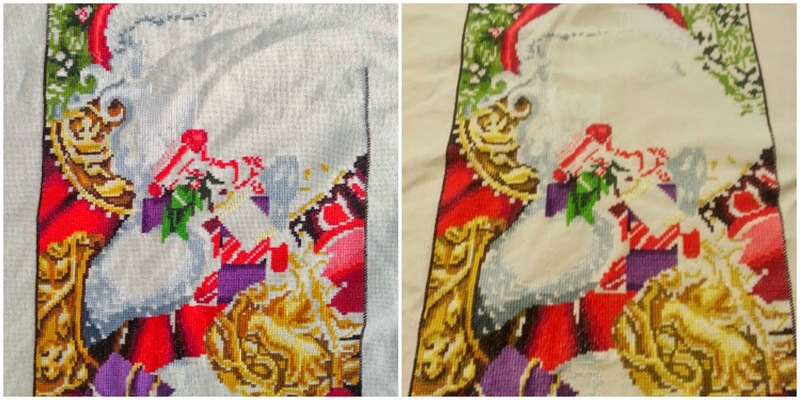 Here is my progress on Mirabilia's Santa. I have started finally on the fourth quarter. When I made my working copy of the chart I divided it up into 4 sections. Made it a little more manageable to work on. And now that I am in the final section I feel like the end is in sight. Next is all the white in his beard/hat and all the beading. At least there is not too much back-stitching to do. I have also been working on Calvin's sampler this week. I am soooo close to being done. I really love this one, and can't wait to hang it above his crib. He still sleeps in his bassinet now by our bed, but lately he has taken to scooting himself sideways when he wakes up and then he gets stuck. 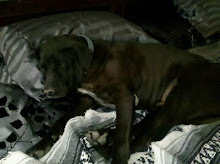 Poor baby! And this is us enjoying some summertime. 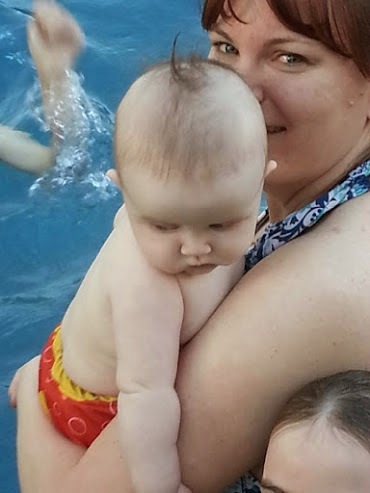 He went swimming in grandpa's pool for the first time yesterday. He actually didn't seem to mind the water at all. Both of my girl's are little mermaids, they swim like fish! I am hoping Calvin will be the same way. Me? Not so much, I never really learned to hold my breath underwater, and hate getting water in my nose. So I was at Hobby Lobby this week, and they already have fall decorations out! It feels too early, especially when I don't consider it truly summer until school lets out. Though fall is my favorite season, I also hate when stores put out there decorations months in advance! 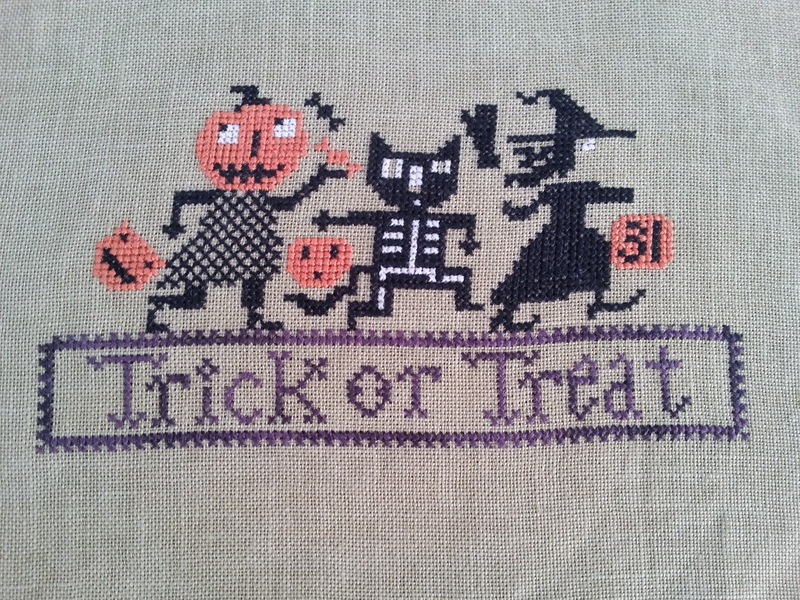 On that note, I'll show off some Halloween themed stitching (have to have time to frame it! ), my PS Trick of Treat. I thought I would get it done this week, and just need to finish the witch/back stitching on it. I love it and can't wait to have it out for my Halloween decorating. Back to summertime, I finished up my Bent Creak eagle, but when I went to frame him (well not really frame I just stuck him in a wooden hoop) he looked to small. So I added some letters off another chart to the design and love how it turned out. You can't really see it in the photo, but I had used a scrap piece of fabric to stitch on, and it has some smudges on it. So I have an opinion question of everyone, to wash or not to wash? I used WDW/DMC for all of him, and they say they are colorfast, but I would really hate to see those dark blues or reds bleed. I'm left with the toss up of leaving it "dirty" or risking ruining the whole thing. What would you do? And this is my stash enhancement for the week. You know how much I love a good "find" right? 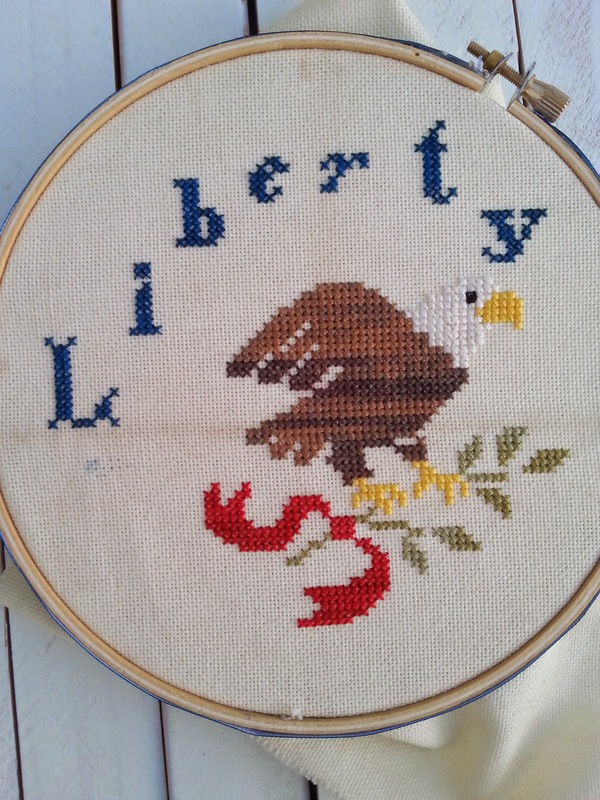 Well I am not against searching Craigslist for cross stitch stuff, and have made some really good finds on it. 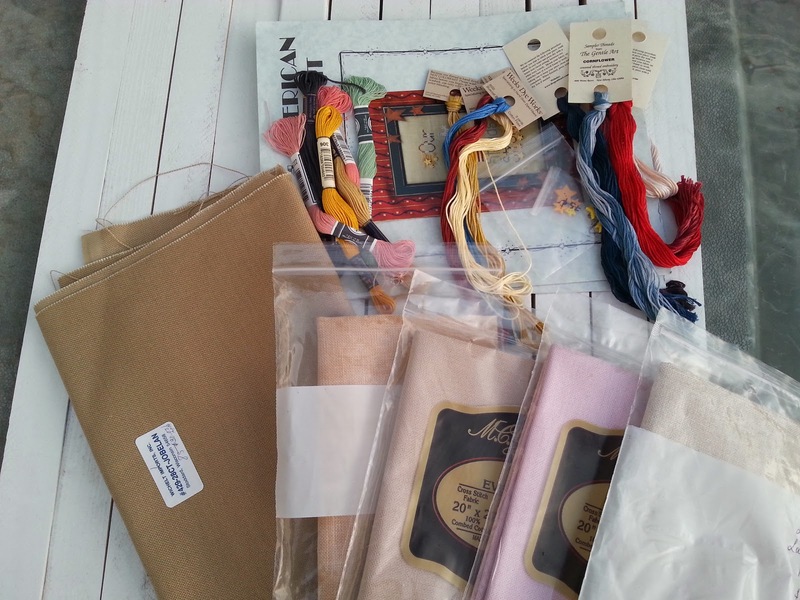 This week, I got 4 pieces of linen + 2 even-weaves still in packages +6 Crescent color threads + 4 WDW skiens + some DMC. From the labels on the linen they would have been about $70, and at $2 a skein for thread would have been about $20, and I bought it all for $21 bucks! Yes sometimes it's more about the thrill of a good deal! Though I stitch enough that saving money on linen really helps. I rarely buy fabric for a specific project I like to be able to just see what I have already. Still going to Weight Watchers, I just got my 4 week key chain and charm today. I have lost 12 pounds already, which is better than I would done on my own, but it's hard not to want all the weight gone RIGHT NOW. I am impatient, and know I didn't get here overnight (heck the baby weight took 9 months to pile on and I had more to lose before the pregnancy). I keep telling myself the slower it comes off the easier it will be to keep it off. Plus it really is a lifestyle change of being healthier.